Sale-a-Bration is off on a roll for the new year and I thought I would share with you a nice card I made using stamps sets and dies that were FREE. Yes, that's right! Here is how it works. For every $50 purchase now through March 31st, from the annual catalog or the Occasions catalog, you can choose a free item from the SALE-A-BRATION catalog. Yes! Isn't that fun? But, that's not all. For those of you that love your Big Shot and cutting out dies, they also are offering a FREE die set with any $100 purchase. This is an awesome deal!! 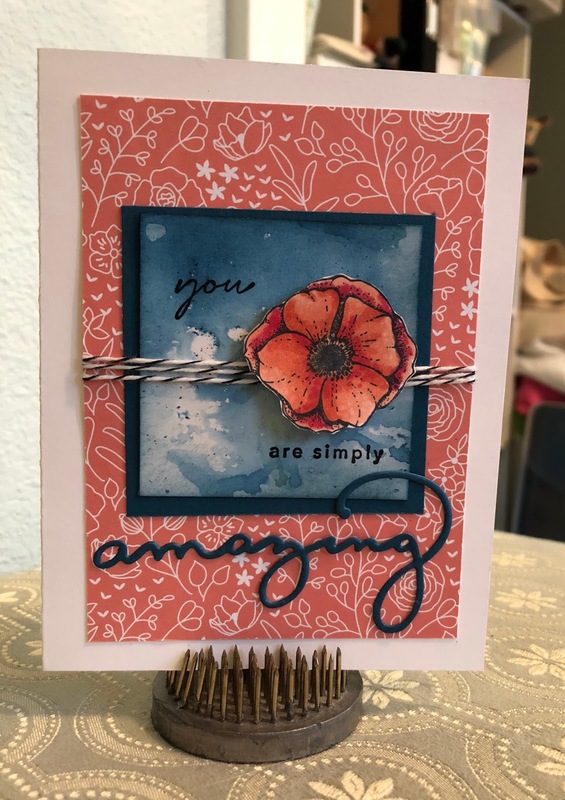 The card I am sharing today was made with Amazing You stamp set and also the Celebrate You thinlet dies. And they were FREE!! I really like how it turned out! The blue background was made with the new Brusho Crystal Colors. Here is how it was done. I used the shimmery white paper, because I think it has a nice sheen, plus it seems to be pretty substantial when I get it wet. I used my spritzer and saturated my square of paper pretty good and then sprinkled a little of the Brush crystals on top and let the magic happen. I have learned that you have to be a little patient with the colors and let them do their thing. I then heat blasted it a bit to get the dry time handled. Each time you do this, you get a new and unique result. The flower was colored with the new Stampin' Blends markers. For those of you that have followed my blog in years past and remember the Copics tutorials I did, these are alcohol markers like those. And they are fantastic because they coordinate with Stampin' Up papers and inks. It's pretty fantastic! The paper used as the background is the new Sweet Soiree Specialty Designer Paper. This paper is so beautiful with lots of foils. I opted to use the backside of the foiled paper, because I liked the color of the Calypso Coral, so as you can see, even the back of the paper is beautiful! If you would be interested in getting your hands on a few catalogs from me, I am happy to send one out to you, or if you are local, I can hand deliver. Just shoot me an email!